Your Next Stamp Challenge #9 Add a Charm! Hello! 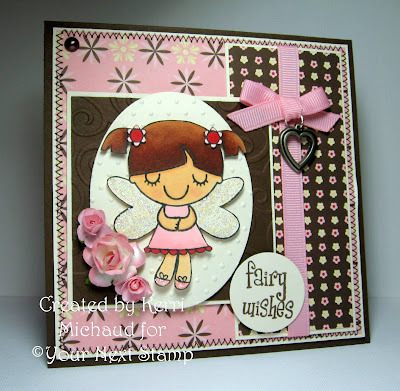 It's time for another Your Next Stamp Challenge, and this time the fabulous Starlet Maureen challenged us to add a charm to our card or project : ) I decided to use this super adorable Fairy Fhiona image. I colored her with Copics, added some Stardust Stickles to her wings, and used some more dp from SU's Sending Love Specialty DSP. The layout is this week's Sketch Saturday layout. We hope you'll play along for your chance to win $10 in YNS bucks to be used towards any YNS stamp and the special Winner Blinkie! Also, Maureen will select a Top Pick winner who will win $5.00 in YNS bucks and the special Top Pick Blinkie! Please check the YNS Challenge Blog for all the deets : ) Thank you so much for stopping by and have a fabulous day! AWWW Absolutely ADORABLE Kerri!!!! LOVE IT GF! Kerri, this is a stunner! So cute! Oh my Kerri, your creations just keep gettin' better and better girl! I LOVE your DP's and color combo here, what a sweet Fhiona! Awesome coloring job..and I love the glitter, flowers, and that charm...perfect! Oh this is totally pretty! I could just spend hours staring at your lovely cards. I love how you pay so much attention to detail, and your coloring is awesome. Those little flowers are so pretty with such a dainty little image. What a lovely and sweet card Kerri, wonderful! The image is super cute. This is one of my favourite colour combos ever! Such a pretty card! Aw! How sweet!! Fiona is colored beautifully!! Love your color combo and layout!! Sweet card! What a sweet card! I love the colors of it! And this heart charm is perfect here! Oh Kerri Fairy Fhiona is so sparkly and adorable! I love your charm and your coloring and your dp - ok I LOVE it all!!! Oh she's so sweet with her shimmery wings and the little roses down by her feet. The little charm is so adorable. Just precious! Very sweet card Kerri. Pink & brown combo is my all time favorite. Your coloring is awesome that made Fhiona looks so pretty. Love the way you did for the bow with the cute charm!!! Very very cute, I like the colors and those flowers you added.